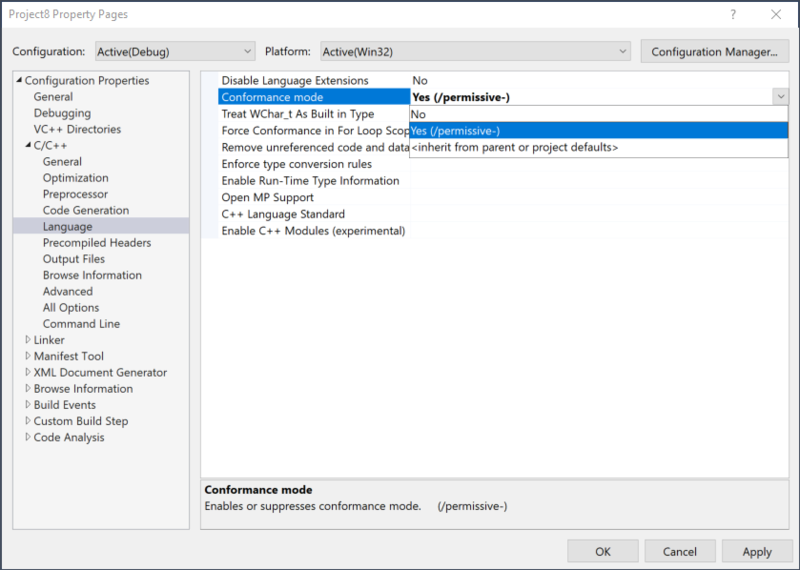 The MSVC toolset included in Visual Studio version 15.5 preview 4 includes many C++ conformance improvements. Throughout the VS2015 and VS2017 releases we’ve focused on conformance with C++ standards, including C++17 features. With VS2017 version 15.5, MSVC has implemented about 75% of C++17 core language and library features. These features can be enabled by using the /std:c++17 version switch. Note that some of these features were included in the 15.3 cycle and completed in the 15.5 cycle. We’ve also made significant progress on fixing older conformance issues including expression SFINAE fixes, constexpr completeness, and the majority of two-phase name lookup cases. Lastly, with regards to current Technical Specifications, we’ve made syntax changes as requested by the C++ Standards Committee. The MSVC compiler in VS2017 version 15.5 implements the syntax change to module interfaces that were requested at the summer meeting. More complete information about C++ conformance improvements in MSVC can be found on docs.microsoft.com and in an upcoming blog post from Stephan T. Lavavej. Conformance mode on-by-default for new projects. We’ve enabled the /permissive- conformance mode by default with new projects created in Visual C++, enabling you to write code that is much closer to C++ standards conformance. This mode disables non-conforming C++ constructs that have existed in MSVC for years. You can learn more about our conformance mode and the /permissive- switch that controls it in this blog post or on docs.microsoft.com. The conformance mode is compatible with almost all header files from the latest Windows Kits, starting with the Windows Fall Creators SDK (10.0.16299.0). Individual conformance features can be controlled by the finer-grained /Zc conformance switches. Because of the number of conformance improvements and bug fixes included in the MSVC toolset that ships with VS2017 version 15.5, we’re increasing the version number from 14.11 to 14.12. This minor version bump indicates that the VS2017 MSVC toolset is binary compatible with the VS2015 MSVC toolset, enabling an easier upgrade for VS2015 users. Try out the MSVC compiler in Visual Studio version 15.5 Preview 4 and let us know what you think! As always, we can be reached via the comments below, via email (visualcpp@microsoft.com) and you can provide feedback via Help > Report A Problem in the product, or via Developer Community. You can also find us on Twitter (@VisualC) and Facebook (msftvisualcpp).